Immerse yourself in the natural wonders of Copper River valley—home of the Wrangell Mountains and America’s largest national park. Enjoy photographic opportunities from panoramic mountain vistas to elusive wildflowers. Feel the energy and rhythm of life as you take an easy walk through the boreal forest. Along the way, you will look for signs of wildlife, explore the delights of the changing seasons and sample edible plants and berries. Enjoy a rustic camp where you can touch the skins and skulls of local wildlife and hear their stories. 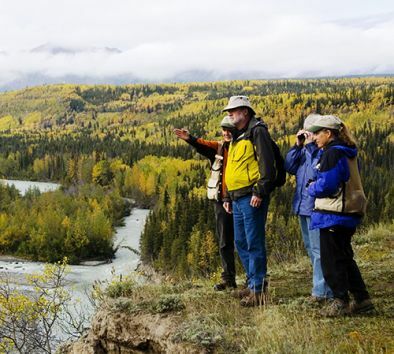 This small group tour includes a scenic van ride with stops to view the Alyeska Pipeline and the Wrangell Mountains. Your naturalist guide is a friendly local resident, happy to share knowledge, answer questions and customize the experience based on your interests. This tour is operated by local nonprofit Wrangell Institute for Science and Environment (WISE). So join in on the fun – smell the aromas of the forest, marvel at the beauty of the flora and ponder the essence of this unique place. Your journey will leave you with a sense of peace and awe, and with the satisfaction that the proceeds of your tour will help sustain WISE’s educational programs, which cultivate observational skills, understanding of nature and stewardship ethics. Maximum weight is 400 lbs. Bring a camera. Wear comfortable walking shoes. Dress in warm layers. Must be able to walk one-mile on forest trails. Visit www.wise-edu.org for more information.